A round-up of recent strike activity in Iran, including the car industry and agriculture. After three weeks of not receiving wages workers at the Alborz Elastics Factory began a strike on July 12. Management had reneged on a promise to pay a New Year's bonus to 400 workers, and has refused to pay into a loan fund for workers despite taking regular deductions from salaries. Loans are intended to be withdrawn when needed, and each worker has paid in at least 1.5 million toomans ($1,500). Following two days of strike action by 1,200 workers the company agreed to pay a portion of back wages to 400 workers and asked them to return to work. The strike has continued with workers intent on receiving compensation for everybody in the factory. 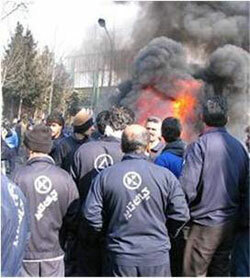 This was the third time that Alborz workers had been on strike in recent months, the last being in February. Workers also blocked a main road near the factory on April 12, leading to an attack by security forces which resulted in the arrest of approximately 100 workers. Workers at the Iran-Khodro car manufacturing plant began a strike on June 28 after not receiving wages for several months. Iran-Khodro has since maintained a heavy security presence inside the factory, taken away worker's ID cards and issued strong statements condemning the strike. Beginning on July 9, workers at the Khuzestan Pipe Factory began a strike over non-payment of wages after contract workers at the factory had not been paid for six months, and permenent workers for two months. After blocking the Ahwaz-Khorramshahr road outside the factory, the strike was broken up by security forces, with many workers being detained. However, it is believed that management have agreed to pay two months worth of outstanding wages. Following months of strikes and demonstrations by workers of the Haft Tapeh Sugarcane Factory in Khuzestan, workers have received two out of five months of outstanding wages. An emergency loan to the company has reportedly been approved by parliament for workers to receive their unpaid wages in full. Workers have said they will renew their protests if wages are not received. Workers at the Kiyan Tire factory walked out on July 20 - the latest in a series of strikes this year - protesting against wage cuts, and have vowed not to return to work until management has met all of their demands. The last strike at Kiyan had occurred only a week previously, with up to a thousand workers walking out of the factory and blocking the highway between Tehran and Islamshahr. 1,200 workers are now on strike after the blocking of another large highway for two hours yesterday, and have vowed to continue their protests until their demands are fulfilled. Kiyan workers engaged in several strikes during March and April, during one of which scores of workers were arrested in a single operation by security forces. Unrest has also been reported at the Tehran Blanket and Iran Therme blanket factories in Ghom, Iranian Steel Industries in Tehran, Long Distance Communications Industries in Fars province, and in the iron mines of Khorasan Razavi Province.